We just completed our extensive “10-Years-After” 2006 retrospective with over 150 wines re-tasted. The vintage is a resounding success! Mosel Riesling blossoms as it matures. Every year, we dedicate the Spring Issue of Mosel Fine Wines to the beauty of mature Mosel. 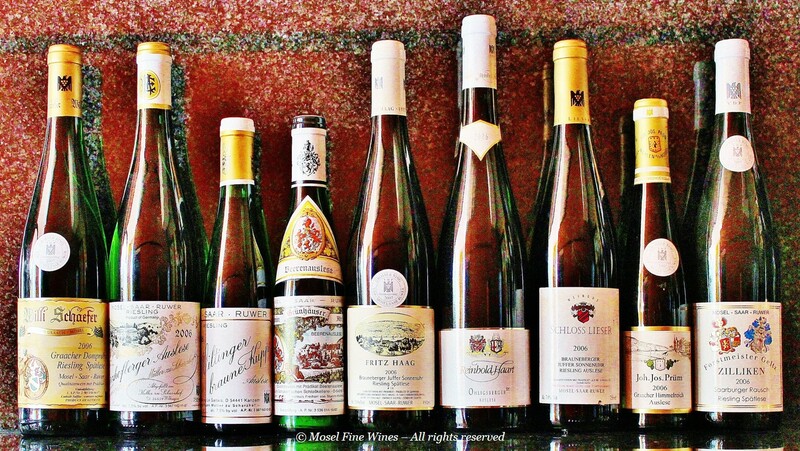 This includes the largest "10-Years-After" Riesling retrospectives made anywhere in the world. After a legendary 2005 vintage last year, the focus shifted to the 2006 vintage this year. A normal growing season came to an abrupt halt when rain played havoc with ripe grapes at the end of September. Botrytis spread like wildfire and Estates rushed to bring in their grapes. However, the pattern was not uniform. Cooler parts of the region (in particular parts of the Saar) were less affected by botrytis. We re-sampled over 150 wines, often whole collections, from the likes of Geltz-Zillliken, Fritz Haag, Schloss Lieser, Egon Müller / Le Gallais, Joh. Jos. Prüm, Willi Schaefer, von Schubert, etc. The 2006 vintage proves a resounding success, with a bevy of stunning sweet wines in the making in a style not seen since the epic 1949 vintage. The 2006 wines burst with complex scents of tropical fruits paired with almond or marzipan. However, what sets these wines apart is that the aromatics lean more towards pineapple and coconut than to the “simpler” apricot and honey usually found in botrytis wines. The duo 2005 and 2006 is already now of epic stature and a tribute to the beauty of Mosel dessert wines (even if neither is fully there ready yet). Anyone can rejoice at having some of these great 2006 wines in the cellar or, if not, should go on their hunt in the auction rooms. These wines are THAT impressive. The complete 2006 Riesling Retrospective including full tasting notes for 150 wines was published in Mosel Fine Wines Issue No 30 (Mar 2016).